Two days earlier, New York City was hit with a massive storm and the anticipation for the trip was a little uneasy of what to expect. The anticipation is always worse though because this day turned out to be better than one could ask for. 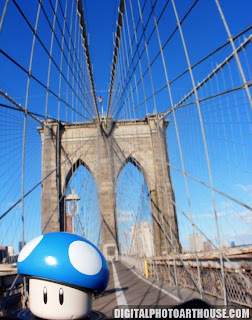 It was a short photo shoot but walking the Brooklyn Bridge supplied many other photo shoots without the Traveling Blue Mushroom. Walking this bridge was an awesome experience and gave you a real feel for the history of New York City and an appreciation for the beauty in the architecture. Walking along the scaling intersecting cables and under the massive rock towers that help to distinguish the Brooklyn Bridge from almost any other bridge in the world really give you a sense for 'They don't make them like this anymore' and considering that it has been standing strong for over 120 years proves it.